There are five broad objections to allowing any more exploration for deep seabed mining. 1. There is no statutory framework, or an inadequate statutory frame work in Papua New Guinea to address the risks from deep sea bed mining. 2. There are no regulations for safety and environmental management of the engineering associated with deep sea bed mining. 3. There is no framework for the distribution of economic benefits arising from deep sea bed mining. 4. There is no organic law supporting provincial maritime boundaries. Deep seabed mining is new technology with new risks. Papua New Guinea does not have a specific statutory framework, or an inadequate statutory frame work to address the risks that arise from this new technology. The Mining Act and Mining Regulations date from the last decade, and they have not been brought up to date. Similarly there are no regulations under the Environment Act that address any risk from deep sea bed mining. Consequently for the State to grant permits or licenses to foreign companies to carry out the exploration of natural resources without having in place “effective measures to control” that exploration, is unconstitutional and unlawful, in itself. The fact that there is no legal framework for the exploration of deep sea bed resources is a fact that should be taken into account by any officer or body, bound by law to exercise any discretion. If a licence were to issue, and there were no body of appropriate laws to regulate the exploration permit, then because the act of issuing the license would have been unconstitutional, then a fact (no laws regulating the activity) that should have been taken into account, was not taken into account, and at administrative law, would be an unreasonable act, and unlawful. This would be so, even if the issuing of the license was otherwise constitutional, because issuing of a license in circumstances were there are risks and no law affecting those risks, is irrational. Deep sea bed mining is a new technology. It is being done for the first time in Papua New Guinea. The Papua New Guinea Government does not have in place appropriate regulations to deal with this new technology. Government has the responsibility to protect all the stakeholders in deep sea bed mining. • The mine and ship workers, and their trade unions, who are engaged in the deep sea bed mining operations. • Provincial governments and local level governments and the communities in the areas adjacent to the mining activity, or likely to be affected by the mining activity. It follows from the fact that there are no statutes or Acts of Parliament dealing with deep sea bed mining that there are also no regulations. What this shows is that the government is rushing too quickly in an area where it cannot properly oversee and regulate the activity. There are no effective controls over the engineering and mining safety associated with deep sea bed mining. There are mine safety regulations in respect of terrestrial mining. But no regulations for sea bed mining. There are no effective controls over the environmental risks that could arise from sea bed mining. This is of particular concern because of the biodiversity priority of life-forms associated with the mining of active submarine vents. But regulations are needed to control the effects of sedimentary disturbances caused by mining the sea bed, and the way those sedimentary disturbances may be affected by ocean currents. Here the absence of regulations dealing with altered metal particles is likely to be important in the long-term because of the effect that metal particles carried by ocean currents may have on coral reefs, or fish-breeding grounds, areas in which fish are know to aggregate, or known areas where commercial fishing is prevalent. In all of these areas there is need for regulation because “the State is to take effective measures to control and actively participate in the national economy, and in particular to control major enterprises engaged in the exploitation of natural resources”. For similar reasons of no constitutional compliance, there should be no exploration that disturbs active vents. Because there are regulations, it is our submission that deep sea vent chimney miners should only be permitted take the inactive relic deposits, and even then the mining safety regime and the environment regime must be strict. Papua New Guinea has no regime of rules controlling these activities, and prudence requires that the rules be developed first before legal rights put into private hands. There are simply no specific rules or regimes to conserve the particularity of deep seabed life-forms.  These ecosystems should be considered similar to life on the moons of Saturn or Jupiter, a very different ecology from what we know about earth surface ecology.  Deep sea vent chimney miners should take only the inactive/relict deposits, not the living, smoking, biologically rich vent chimneys.  Grinding up living chimney communities is like removing the Galapagos Islands before Darwin got there.  These submissions are well supported by science.  There has been an explosion of science journal papers on the biology & geochemistry of deep and shallow sea vents in the past two decades, and in vent biology and chemistry.  Oceanographers have already expressed concern about the need for some kind of protection, regulation or rules for sampling these exotic biodiversity hot-spots by the science community. Some of the Cascade Margin, Gulf of Mexico, Blake Plateau, and Mediterranean vent chimney communities have already been surveyed, mapped, numbered, marked with steel post signs, and some have long-term benthic lander monitoring devices on the sea floor.  There are perhaps a dozen or so, large oceanographic institutions that have ships and experienced scientists that have been working on these vent systems since the late 1970s. There are dozens of websites that have videos and photos of chimney ecosystems in action, smokers puffing away. There are major issues with the regulation of existing deep-seabed mining in Papua New Guinea that show new exploration permits should not be granted until a set of regulations are in place. Because the technology is now available, once the ships are in place, actual mining quickly follows exploration. Current delays are associated with the world economic down-turn and general drying-up of loan capital. 1. "...The Solwara 1 project proposes to commercially exploit gold and copper deposits associated with deep-sea hydrothermal vents at a depth of 1,500 in the Bismarck Sea off Papua New Guinea. As the Project would represent the first large-scale, human-induced, site-specific disturbance to the deep ocean basin anywhere in the world, it must be considered with exceptional deliberation and caution. 3. Deep-sea hydrothermal vents, found along mid-ocean ridges and back-arc basins (such as the Manus Basin in the Bismarck Sea), support one of the rarest and most unique ecological communities known to science. Organisms derive their energy from sulphide chemicals in hot (350 C), mineralized vent fluids rather than directly or indirectly from photosynthesis as in other biological communities, and/or from endosymbionts in their tissues. 4. Most species discovered at vents are new to science, and the vents support communities with "extremely high biomass" relative to other deep-sea habitats. Some scientists suggest that such deep-sea hydrothermal vents systems may be where life first evolved on Earth. The proposed Solwara 1 mining project would destroy an extensive patch of productive vent habitat, including tens of thousands of vent chimneys, killing virtually all of the attached organisms. "The extent of the impacts to vents and other seafloor habitats directly mined will inevitably be severe at the site scale,"
"it may be many years before development of chimneys returns to pre-mining conditions (emphasis added). "mining is expected to alter venting frequency and characteristics on surrounding seafloor areas as well, thus affecting the ecological communities of a much broader scale than just the mined site. 6. Concerns regarding Project impacts summarized in the EIS include: "loss of habitat and degradation of water quality; loss, regional or wider scale loss, of endemic or rare species; decreased diversity of species or higher taxonomic levels; and loss of knowledge or of future opportunities (i.e., what we do not know)." It is highly likely that all of these will occur. 7. The ecological footprint of normal operation of the project will be significant. An 11-hectare area of the sulphide mound at Solwara 1, all of its associated organisms, and tens of thousands of vent chimneys would be removed and destroyed by the mining process, down to a maximum depth of 220 m below the existing sea floor. 8. It is expected that mining will impact venting frequency, location, and intensity at areas surrounding the mined area, and thus impact these nearby biological communities. Recruitment of vent species at other vent sites downstream from Solwara 1, including Solwara 8 approximately 45 km to the north west, will likely be reduced. The 245,000 tons of waste rock and unconsolidated sediment overburden will be disposed down-slope, and extend 2 km or more from the discharge site. The suspended sediment from mining operations and disposal of waste will settle over an extensive area of seafloor habitat, resulting in the smothering of benthic communities. The discharge plume from the de watered ore with 6,000 mg/L suspended solids, increased metals leached from the ore, and elevated temperatures up to 11 C, will be discharged 25 m - 50 m above the seabed, and will exert detectable impacts 10 km from the site. At the expected discharge rate of 0.3 m3 / sec, over 10 million tons / year of contaminated effluent will be discharged into the deep-sea environment. 9. Underwater noise from the Project is expected to be audible 600 km from the site, and could induce masking effects in cetaceans 15 km from the site, and behavioral response much farther. And 1.44 million m3 (tons) of ballast water from bulk ore carriers, potentially contaminated with exotic invasive species, will be discharged into nearshore waters off New Britain. Project impacts are expected to be regional in extent (extending more than 10 km from site), prolonged in duration (lasting beyond 1 year), and have high degree of severity (severe negative impact on populations, community or ecosystem survival or health). The relative impact of the proposed Project on the globally rare and unique habitat found only at deep-sea hydrothermal vents would be proportionately far greater than, for instance, impacts of terrestrial mines on global forest habitat. 10. Further, the footprint of the Project would be considerably more extensive and severe if accidents occur. The accident scenario of most immediate concern is that of the loss of an ore shuttle barge, with 6,000 tons of toxic ore, fuel, and other hazardous material onboard, or a bulk ore carrier with 25,000 tons of ore and fuel onboard, in the near shore environment off New Ireland or New Britain. ..."
There are no laws that apportion the surpluses to be gained from deep seabed mining. With deep sea bed mining, once a suitable mining ship has been built, actual mining may well fast upon the completion of an exploration license. Fiscally, Papua New Guinea does not have an appropriate mining tax regime to deal with deep sea bed mining. The Solwara 1 Project could gross as much as 1 billion US dollars in a 30 month lifetime. Taxes under the current laws maybe $US45 million or so. There are no special tax laws in place to deal with deep sea bed mining. The legal situation is a mess. There is no effective control. There can be no “wise-use”. The projects are clearly unconstitutional because of the lack of control and inadequate provisions to safeguard the rights of future generations through apportionment of the surpluses. The Organic Law on Provincial Boundaries deals only terrestrial boundaries. One of the current applications for exploitation licenses straddles what are generally thought of as Madang Province and Manus Province waters. 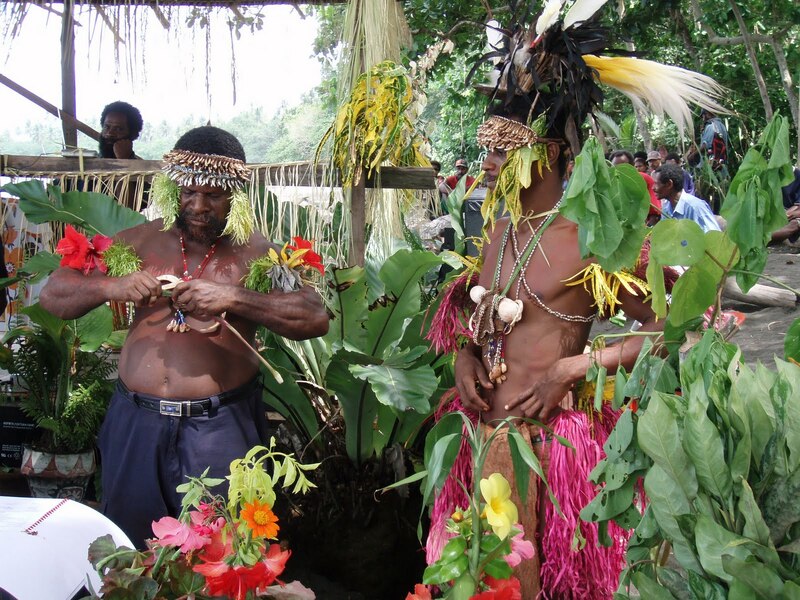 But there is at least one other application that straddles what are generally thought of as Madang Province and East Sepik Province waters. There are no laws saying how surpluses are to be shared by adjacent provinces. On the 18th of December 2008 Mining Magazine, reported Nautilus Minerals Inc, the parent of the Applicant issued a statement to say that the Solwara1 mining system and the timetable for the first ore production at Solwara-1 is expected to be delayed beyond December 2010. Orders for equipment have been either cancelled or delayed. Up to 30% of the work force has been laid-off. The reports indicate that the global economic down-turn has affected the Applicants parent cash-flow, and Solwara-1 has been effectively ”mothballed” on a low-level maintenance for at least two years, but the exact date is uncertain, and so the “mothballing” could be longer. In our submission, it is not rational to grant further new exploration permits to a company that may not have the capital to mine, or access to the capital to mine, particular when the country has no regulatory frame work in place. To grant additional licences would be imprudent and simply not make sense in the circumstances.. The applications for further exploration permits should not be recommended because the Applicant has not been able to further past grants of exploration licenses into actual mining. The Applicant should be allowed to prove itself with Solwara-1, only after appropriate laws and regulations have been enacted. Only then could the authorities be in a position to consider any application for new permits from that Applicant or its associates. Whole issue of Oceanography Magazine, vol. 20, No. 1, March 2007, on Inter ridge research, including a lot of papers on hydrothermal vents, vent microbes and invertebrates, good photos and diagrams, vent biodiversity & bio geography, vent gases and minerals, some history of the 1977 discovery of the vents offshore from Panama, ROVs and AUV equipment, hard bottom drilling gear, and worries about protecting unusual vent ecosystems from the ravages of ship sampling. Whole issue of Marine Geology on Sedn & Seafloor Hydrocarbon Emissions on Deep European Continental Margins, edited by M. K. Ivanov, N. H. Kenyon, A. E. Suzyumov, and J. M. Woodside, vol. 195, issues 1-4, 30 March 2003. Whole issue of Marine Geology on "Geosphere-Biosphere Coupling: Cold Seep Related carbonate mound formation & ecology", vol. 198(1-2), 30 June 03, 2003, Editors T. J. C. E. van Weering, W.-C. Dullo, and J.-P. Henriet. This includes papers on mounds off the coast of Norway, Ireland, and the Gulf of Mexico, mud volcanoes, gas and methane hydrates, some biological DNA taxonomy. Chemical Geology (Vol. 205, Issue 3-4, May 2004) Geomicrobiology and Biogeochemistry of Gas Hydrates and Hydrocarbon Seeps, Edited by: Chuanlun Zhang and Brian Lanoil.Table of Contents at the end of this file. Abstracts are in the References Folder. Volume 24 Number 3 (2004) of Geo-Marine Letters is on hydrocarbon seeps in marginal seas, edited by John M. Woodside, Robert E. Garrison, J. Casey Moore, Keith A. Kvenvolden. AAPG, Edited by: M. A. Abrahams, J.K. Whelan. Table of contents at end of this file. Chemical Geology Special Issue on Shallow water Hydrothermal Venting, edited by R. M. Prol-Ledesma, P. R. Dando, and C. E. J. de Ronde, vol. 224(1-3):1-182. They focus on vents in <200 m water depth, and find rather different expressions of metal and hydrocarbon tracers on the seafloor. Environmental Geology vol 46 (8) 2004. Most of this issue is on methane seeps, hydrocarbons, mud volcanoes, Alvin and ABE expedition logs and photos, mostly of deep hydrothermal vents., click on Magic Mountain, and many other video clips showing vent chimneys on the Cascadia Margin at 2000 m water depth. Marine Geology 227 (3-4), March 06, has a series of articles about mud volcanoes, seeps and vents, bottom reflectors. "http://www.pmel.noaa.gov/vents/home.html" , submarine vent website for the Pacific Marine Environmental Laboratory in Seattle. Videos of vent fields from the Juan de Fuca Ridge, off the coast of Oregon/Washington State and BC. Photos of biota, microbial communities. Their "ring of fire" globe shows the ring going through the Timor Sea.